Charles M. Goodman was Washington’s foremost modernist architect working in single-family housing in the 1950s. He was the first of several Washington-area architects working in the Modern idiom in the post-World War II era to apply the style and its tenets in a significant way from architectural and land planning perspectives. While Goodman worked in both the custom and builder sectors of residential architecture, he is best known for his builder housing. Charles M. Goodman and his firm transformed the concept of suburban living by designing glass houses that removed the barrier between interior and exterior. 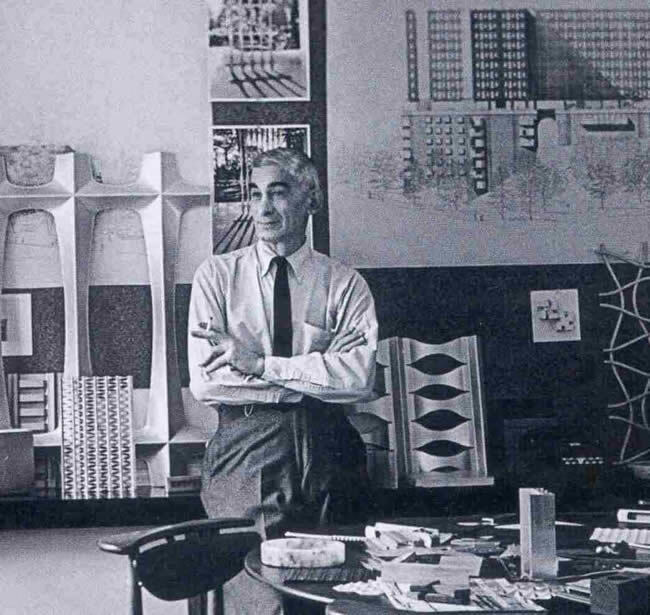 Goodman made his greatest contributions to the architectural profession by opening up the wall, reinventing the house plan numerous times through innovative floor plan ideas, using nontraditional materials, and unifying the house and its surroundings. His work was widely recognized during his own lifetime, but banking and lending insurance practices, coupled with a conservative Washington mindset conspired to keep the interest in Modern architecture limited to a minority of progressive practitioners and homeowners. Three of Charles Goodman’s Montgomery County subdivisions have been listed on the National Register of Historic Places, nominated by homeowners who have demonstrated an unflagging commitment to preserving these modernist gems (see list below). Goodman designed unique houses throughout the Washington, DC region. He also designed government buildings, air terminals, office parks, schools, and churches. But it is his housing that represents the best-known aspect of a highly successful career. While his most-publicized project, Hollin Hills, is located in Fairfax County, Virginia, he actually worked to a great degree in Montgomery County, Maryland. There are upwards of 275 single-family dwellings in Montgomery County alone. Goodman was responsible for all or part of seven separate subdivisions in Montgomery County and for the creation of several prominent custom homes here. Purchase your copy of Clare Lise Kelly's book highlighting modern architecture in Montgomery County, MD.